December is approaching and we will have to move indoors to continue our sketching. In doing so we have an opportunity to celebrate this season of holidays and be exposed to major works of art housed in the many houses of worship in our city. If you are not familiar with St. Bart's please look at their web site page about the art and architecture of the building: http://stbarts.org/about-us/art-architecture/ Of note are the stained glass window and the Hildreth Meiere mosaics. Meier was a major Art Deco artist. She designed murals for many houses of worship, municipal buildings, the fabulous lobbies in the many art deco skyscrapers and ....Radio City Music Hall. In order to coordinate this event I will need a confirmed RSVP from anyone interested in going. I am waiting for confirmation of the date but it will be a Tuesday morning. We will have to make a small donation to the church for allowing us to be there, so anyone who comes will have to contribute $5 to attend. If you are interested in participating in this event please contact Raylie Dunkel at raylie@verizon.net to reserve your spot. We will need 10 participants to be able to hold the spot with the church. 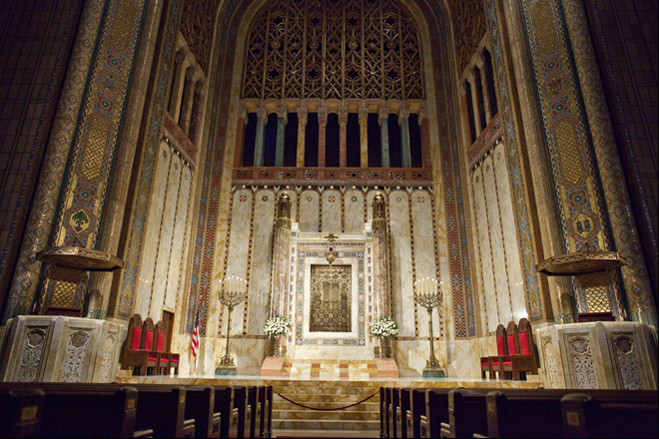 Following on this event we will visit another house of workshop that also has Hildreth Meiere mosaics, Temple Emanuel. Besides the towering sanctuary there is also a museum we can visit. There is no cost for this venue and we can revert to our Wednesday schedule. We can combine this site with the Arsenal in Central Park for the afternoon. NYC offers and embarrassment of riches in beautiful houses of worship. As a group we can decide on a third venue for December. Other possibilities are: St. John the Divine, St. Patricks Cathedral, Central Synagogue, Trinity Church, Marble Collegiate, and The Little Church Around the Corner to name a few.